Shotgun and ammunition to be kept near to the entry point? Great idea even for everyday living! It is amazing and very creative, i would also like to go for this type of house but roof should be there. I would love to learn to build one of these in Ghana this summer…Is there a way I could attend a workshop or online course? Am interested in buying plans to present to the Building Dept. , so I can have all my ducks in a row. Love this design and what is the estimate of the total price of building…Labor is very inexpensive in the area where I have set up my non-profit. Am willing to travel anywhere in the world to attend the workshop. I just emailed you the details. The main expense is labor. You’ll have to do a detailed cost estimate to determine the total cost. Some cost estimate information is available on our websites, and the topic is covered in my upcoming earthbag book. Use the search engine on the upper right corner of our blog and enter the phrase “how many bags”. What are all of the feature for the shelter? How do you find where to purchase some of the plans for you designs? This is very exciting for me. I live at sea level so we can’t have basements and can’t dig shelters. This would be the perfect solution. The possible features you could add on are nearly endless. This could include nearly any feature you see in any other shelter — pantry, ham radio, Internet, solar hot water, photovoltaics, etc. This plan has to be ordered direct from me. Email me at strawhouses [at] yahoo.com. 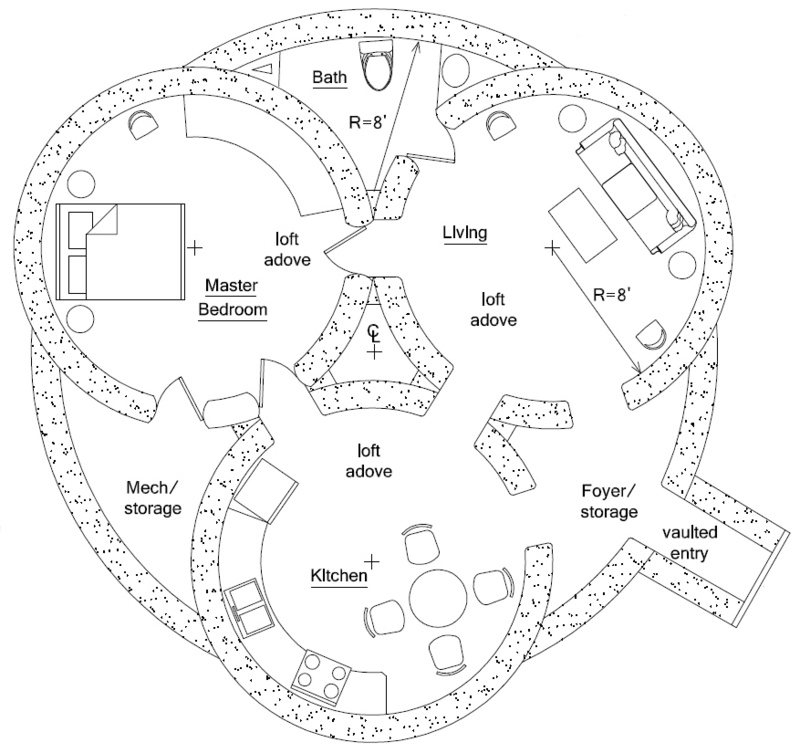 Hey i was just checking out the triple dome house that you designed and i was wondering how safe the shelter is for nuclear fallouts and out disasters. I just want to know what makes the bags so safe and how good they hold up against what. Also where can you build them? And on and on it goes. And keep in mind earthbags are not just bags of dirt. They’re large building blocks (or tubes) of compressed earth, which is bullet and blast resistant and can last hundreds or even thousands of years. Well ya know a survival shelter is bunk when it leaves no place for serious food storage. Maybe pack a futon, one of those rooms needs to feed folks for a few months. Don’t forget stores of energy, too. For the fallout. Look more closely at the plans! There’s lots of space for food and supplies. What do you mean by lower level? The domes have to follow a uniform string-line throughout the building process. In other words you could build smaller diameter domes, but they will be proportionally the same. Just to clarify — you can’t round over the tops or the earthbags will be unstable. There’s no way to estimate the total cost because prices vary so much from place to place. Also some are more thrifty than others. One person might spend hours looking for misprinted or recycled bags while someone else pays full retail. Same is true with every item needed. And it’s similar with work crews. One guy may work harder than 2-3 other guys. Trulli (the plural) are considered historic buildings in Italy, and any renovations must be done to very strict standards. But you like dome houses, it’s worth looking into trullo design for ideas. Some have been modernized into some pretty fantastic designs. Actually, this trullo is probably closer. and I’m sure there’s a wikipedia article. 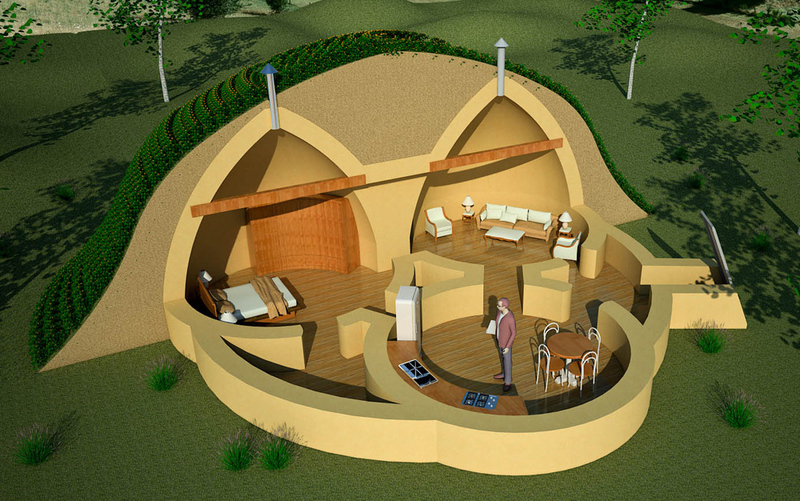 How can I buy plans for the triple dome survival shelter? Would it be possible to purchase a modified version of this plan for above-ground construction and add windows, as well as a heat source like a wood-burning stove to the living room? I would like to build something like this and cover it in a geopolymer lime plaster, and maybe some stone. I really love this design! The space is very efficiently used. Yes, but you’d have to deal with the water that would build up in the center. Are you in a dry climate? how feasible is geothermal for a place like this? or some other power source you could use if you were stuck there for a while. could you communicate with the outside world from there? any radio frequency that can penetrate those walls if you need to set up a relay? for food storage, would probably concentrate on pemmican. cant think of a more calorie dense, healthy, shelf stable food. also, canned fish, nuts, honey, chocolate, rice, and vitamins. none of that would waste power on refridgeration or cooking. Geothermal is very expensive. Get a quote for your area. Seems like propane is the practical fuel source for this design. Hopefully it would be for only a fairly short time period. I would add bulk grains (sealed in 5-gallon plastic buckets), oil, salt and spices to the food storage list. But it seems highly unlikely any code officials will accept this design. There are no windows, no back door for egress, etc. Do not buy until you get more information from them. I love this plan! It may be slightly overkill for us right now but I’d love to speak more with you Dr. Geiger about our resources and needs to see if you can help us select just the right plan. We have 20 acres in WA State and approx 3000 bags in hand. Is it possible to send you an email with more details? The usual precautions apply same as any house. Research if radon is a problem in your area. Do a preliminary test if in doubt. If it is, then use standard building techniques to vent the gas away from the living space. This can be done for a few hundred dollars or $1,000 tops unless you have special building codes. I just emailed you. Our Resources page lists some of the largest bag suppliers (scroll down). This plan has sold at least 2-3 times, but understandably projects like this are never reported on or publicized for obvious reasons. We always suggest starting out with a small project like a tool shed to help develop skills. There’s a learning curve to everything. We have free dome plans you can use that would work perfectly. That way there’s no risk — you’ll know for sure if this type of building is right for you. Could you fill the center with dirt and cover it in limestone plaster to prevent it from filling with water ? Fill the center area with tamped layers of road base and then cover the top with EPDM rubber membrane. It’s expensive but will not leak if you cover with soil and plant grass on top. Are the domes safe to be buried as on the picture? Thanks for sharing! Yes, if they’re built correctly. Domes (arches) are the strongest forms in nature. You could bury them under hundreds of tons of soil and the forces will go around the domes and into the ground. Wow. This design is perfect. How does one go about purchasing plans. Thank you. Plans are available from Dream Green Homes.com. Not all plans are shown. Write Kelly if you don’t see the plan you want. The shower is in the bathroom. Note the little symbol on the left side. In this proposed plan there is no shower surround, just open space covered in tile. This is popular in different parts of the world and is one way to cut costs. Is this available in the UK? Is planning permission required? Only the most popular plans are listed. This one is not shown but you can simply order any plan for the same price and leave a comment that you want the triple dome shelter and I’ll make sure you get the right plan. This plan is difficult to build by the way. I recommend starting out with a small dome or smaller survival shelter. Always check code requirements before buying anything.